Thompson is currently developing a new exhibition Get ready you mother... for Galeria Carles Taché Projects. The exhibition will take place in september and is being created in collaboration with the Museu Nacional De D'Arte de Catalunya in dialogue with the work of Jose Maria Sert. Get ready you mother... is an installation and performance that examines the theatrical justification of revenge and gestures of spiritual and physical protection. May 12th Thompson inaugurated a new sculpture created in collaboration with Biscottificio Fratelli Lunardi, Torneria Peruzzi, Falegname Michelacci Fusti and Biancheria di Casa Creazioni Divina as a part of Fuori Expo in Milan. The project is part of an exhibition Oltre Città curated by Giacomo Bazzani that connects artistsworking in the region of Tuscany with artisans in the city of Quarrata. March 5th New exhibition Sweet Excorcist opens at Texas A&M Corpus Christi's Weil Gallery. The exhibition is a collaboration with Bradly Dever Treadaway. February 28th don't miss the opening of New American sculpture curated by Dexter Wimberly at Fivemyles Gallery in Brooklyn. 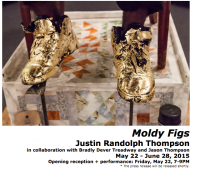 A recent work done in Collaboration with Bradly Dever Treadaway will be on display. Thompson recently engaged in a collaborative residence at CAC Woodside in Troy, NY in January 2014 with Bradly Dever Treadaway. Together, they realized a new work Hand For a Hand that is Forthcoming. Thompson has a major forthcoming performance in Peekskill, NY Summer 2014 titled Fit the Battle. The project is a commemoration and celebration of Paul Robeson in dialogue with the 65th Anniversary of the 1949 Peekskill Riots. The piece is in collaboration with the Peekskill Public School System, Bradly Dever Treadaway and Jason Thompson. Thompson is a 2013 Emerging Artist Fellow at Socrates Sculpture Park where he created the sculpture and performance Brutus Jones in residence this July. The exhibition of new fellows opened September 8th and will be on view through March. http://www.socratessculpturepark.org/exhibitions/exhibition/eaf13 A performance Based vdeo is forthcoming in 2014. Thompson recently presented a new installation with an artist collective Ridicolo Grupo at Palazzo Lucarini in Trevi, Italy July 13th. The project Correspondencia is part of a series of interventions with the group since thier founding in 2009.The performance Joshiua can be found on this site. Other forthcoming projects include The Blackamoor Project curated by Awam Amkpa for NYU's Florence Campus, and Sweet Exorcist in collaboration with Bradly Dever Treadaway for the Weil Gallery in Corpus Christi.